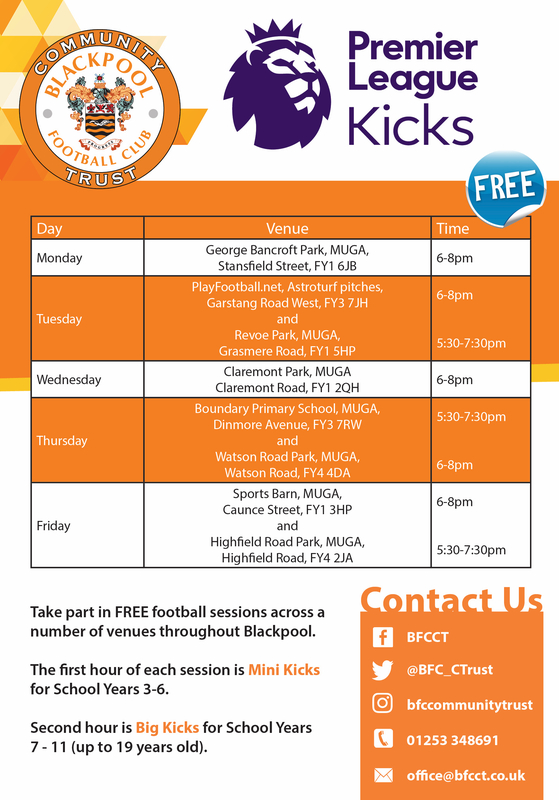 Blackpool FC Community Trust offer Premier League Kicks sessions across Blackpool for 7-19 year olds whilst creating opportunities for young people at the heart of their communities. Premier League Kicks uses the power of football to connect with young people in some of the most high-need areas of Blackpool. We currently have several Kicks sites in the local area operating across Blackpool. New participants should fill out a consent form from here, come down to one of the sessions and hand it to one of the qualified Blackpool FC Community Trust coaches. As well as the free football sessions, Kicks also offers pathways into regular competitive football matches and tournaments with other Community Trust Kicks teams throughout the country. Kicks delivery is on during term time and every session is completely free of charge. Please note, you do not need to be in education or employment to attend Kicks Sessions.